G’day mates! Travel towards the Great Ocean Road from Melbourne and as you skirt Geelong on the new bypass you’ll cross the Moorabool River on the Lewis Bandt Bridge. It’s a name with great automotive significance. Bandt is credited with inventing the ute. The story goes that in the early 1930s Ford received a letter from a woman wondering if there could be a vehicle in which her husband could take pigs to market during the week, and her to church on Sundays. Rough and ready trucks existed but Bandt, who worked for Ford’s design department, took a two-door 1933 Ford V8 coupe and grafted on to it a cargo-carrying tray. 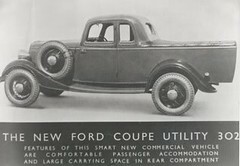 Ford released the Coupe Utility the next year and that’s how it all started. Ute is believed to be an abbreviation for “utility” or “coupé utility”, a term used originally in Australia and New Zealand, then also South Africa to describe passenger vehicles with a cargo tray in the rear. Well aren’t these just like pick up trucks? Close but not quite. Pick up trucks are built on a truck chassis while the Ute is built on a car chassis. Utes are gone here in the US but are huge in Australia as my daughter will find out this summer when she travels there as a Student Ambassador in the People to People Program. Traveling there for me is high on my bucket list! Ford beat Chevy to the punch with the Ford Ranchero, a coupe utility produced between 1957 and 1979. 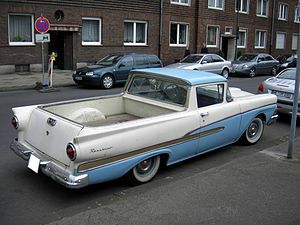 Unlike a pickup truck, the Ranchero was adapted from a two-door station wagon platform that integrated the cab and cargo bed into the body. A total of 508,355 units were produced during the model’s production run. It was adapted from full-size, compact and intermediate automobiles by the Ford Motor Company for the North American market. 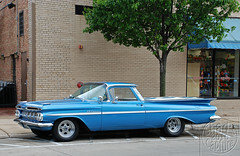 Seeing the success that Ford had going Chevy jumped in with the El Camino built 1959–1960 model years. Production resumed for the 1964–1977 model years based on the Chevelle platform, and continued for the 1978–1987 model years based on the Malibu. Although based on corresponding Chevrolet car lines, the vehicle is classified and titled in North America as a truck. GMC’s badge engineered El Camino variant, the Sprint, was introduced for the 1971 model year. Renamed Caballero in 1978, it was also produced through the 1987 model year. You can get the real deal for around 20 grand. I like the later years because many were essentially muscle cars. Zoom…….. 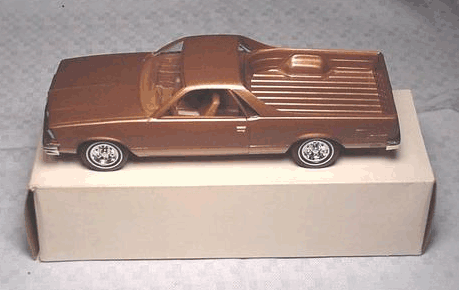 I checked around on the auction sites found the scale El Camino promotional models very affordable. Both this 79 and 82 were priced around $20. 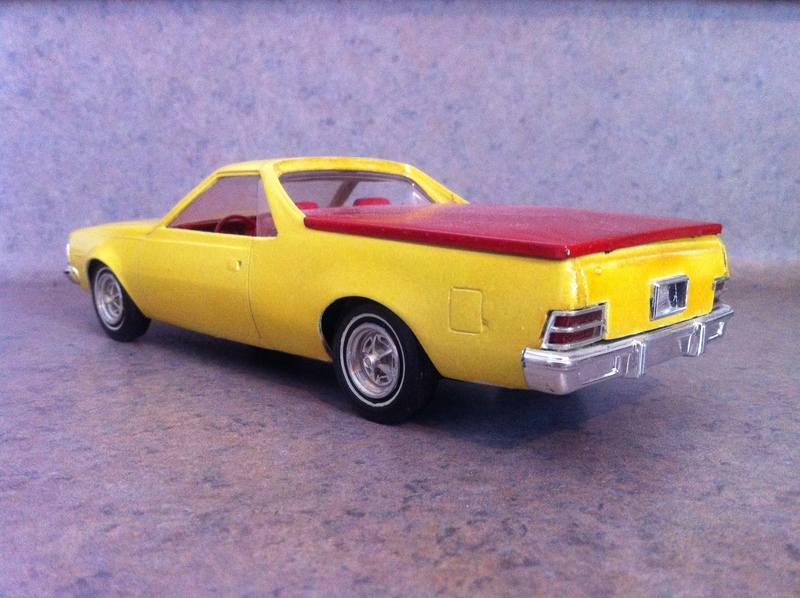 The first-generation vehicles were available from SMP and AMT as both promos and kits in 1:25 scale, which continued after 1964, when the El Camino joined the Chevelle lineup. There were no 1973-77 models were not produced in miniature but starting back up in 1978, both promos and kits were once again available from MPC. The promos were done in many popular colors, and were produced until 1983. 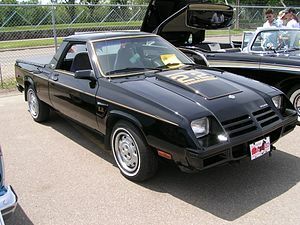 Tardy to the party were Chrysler’s two entries the Dodge Rampage and Plymouth Scamp which was a subcompact, unibody coupe utility based on Chrysler’s L platform and manufactured from 1982–1984. First released as a 1982 model, the Rampage was later joined by its rebadged variant, the Plymouth Scamp. The Rampage borrowed the car’s unibody construction and the front fascia from the sporty 024/Charger variant. The market for “car-trucks” was fast drying up in the mid-1980s. The Scamp lasted just one year, 1983 while the Rampage production a year later as one after another was dropped from automakers’ North American product lines. 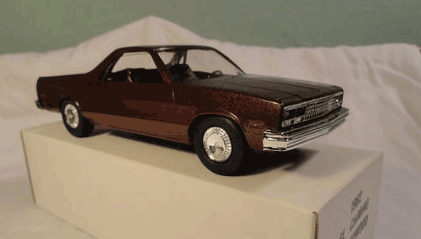 Even the El Camino was not immune and it was also withdrawn from production before the decade was through. Needless to say there were no promotional models made for the Rampage/Scamp. I did find a Matchbox model though. Pontiac played with the idea twice. Once in 1959 and again in 2008. in 1959 GM experimented with a Pontiac coupe-utility based on the full-size Catalina sedan, coupe and wagon platform. Legend has it that Pontiac built two of these 1959 “El Catalina” utes. One was used as a parts-hauler around the factory for many years, but the idea was never OK’d for production. The last effort by Pontiac to build a pickup was its most serious and over the top cool. 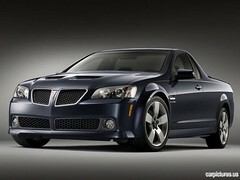 It came in 2008 when the 2010 Pontiac G8 ST was introduced to the public at the New York auto show. The G8 sport truck was based on the Holden ute from Australia, where car-based trucks have long been popular. It would have come to market with a 361-horsepower V-8. This is something that gets my heart pumping. It was killed as part of GM’s initial restructuring efforts that caused GM to kill the Pontiac brand all together. 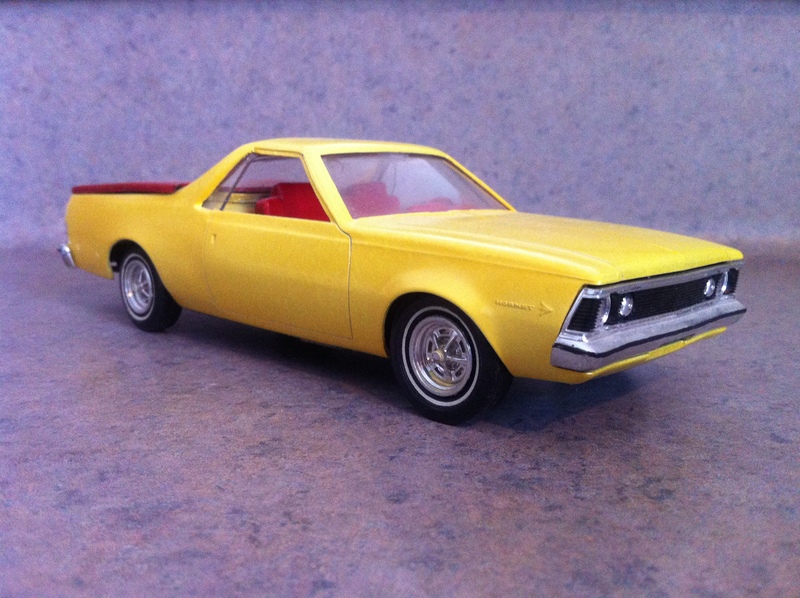 I was able to find a Holden ute in HO scale but most of them are diecast in some of the larger scales but you can only get them from Australia. Postage is a killer. Humm, another item I’m going to ask my daughter to bring back with her. Faced with competition from the Japanese n the early 1970s, American Motors (I know what you’re thinking, anyway to work AMC into the story) was planning a compact coupé utility (pickup) based on the Hornet to compete with the Japanese utes. One prototype called the Cowboy was developed. The prototype vehicle featured a modified AMC Gremlin front design and a cargo box with a Jeep logo on the tailgate. AMC’s I6 engine would be more powerful than the 4-cylinders found in the imported pickups. This is the only surviving prototype which was built using a 1971 Hornet SC360 with the 360 V8 and 4-speed manual transmission. It was used by AMC on their proving grounds for several years before being sold to an employee, who later installed a 1973 Hornet updated front end. I’ve seen this in Kenosha at the American Motors Association 100th Anniversary event. The Cowboy never made it into production because the Hornet was selling well, there wasn’t a 4WD system available at the time and in 1970 AMC bought Jeep. Well since I had lots of promo Hornets lying around I decided to make my own Cowboy by essentially grafting a 70 Hornet, to the back of the front doors, with the back of an El Camino. I utilized the Hornet tail lights and the rear bumper. The roof line has more of a slant but I kind of like it better than the real deal. This was a fun project and it is a one of a kind promo model, well sort of.